Great South Bay Quilters is a nonprofit, 501(c) (3)organization that was formed in 1983. 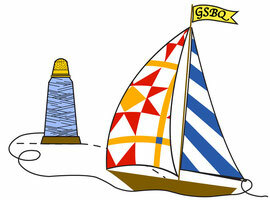 It is the only quilting guild of this type in the Islip, NY area. We are a group of fabric arts enthusiasts who gather together once a month from September to June to share ideas, learn new techniques, and give back to the community. Our 60 members are all volunteers who serve as officers and committee members of the group. We are both experienced and novice machine and hand quilters. For more detailed information on our meetings, please click here. 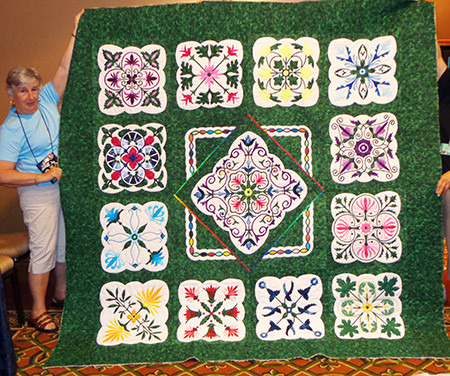 Pictured at right is charter member Audrey Collins with her impressive Magical Medallions quilt.